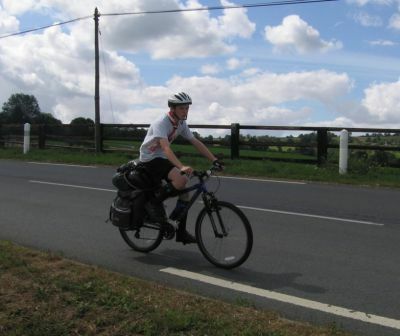 The cycle expedition involves camping in public campsites and travelling between them on our cycles. All kit including the tents and cooking utensils are carried in panniers and on top of the rack on the bike. The cars are left at home for this one! Places of interest are visited on route. The patrols get to camp on their own without leaders (although leaders will keep an eye on what is going on). This is where all the scouting skills come together. Wolf Cubs, Scouts and Senior Scouts all camp together on this camp. The camp usually has a theme as does the menu. This is usually a long weekend (Friday night to Sunday afternoon). The scouts cook on open fires and usually cater for the rest of the group. We usually have a hike on the camp and of course a camp fire. Depending on the theme of the camp, we may be doing pioneering, fist aid of working towards another badge. 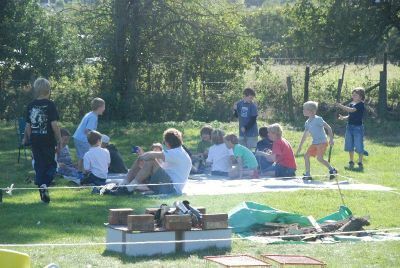 This is a week long camp (usually) in the school summer holidays. This camp is usually not local. Previous locations include Losksters Pool and Brecon. We camp on green-field sites. 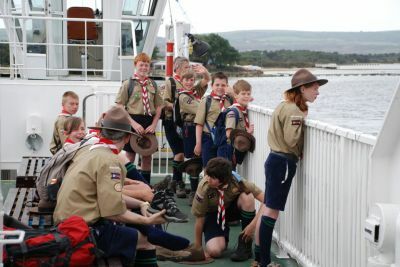 Some scout groups have moved away from using green-field sites and have taken to using 'Activity Centres' with all kinds of prefabricated facilities. We believe that this is not camping in the spirit of scouting. We want our scouts to experience the true outdoors and see how one can camp quite comfortably without endless facilities. Therefore, for our scout camp, we will always endeavour to use a green-field site and dig our own latrines, wet and dry pits, and fire pits and create our own cook-house areas. Of course, we always take turfs and return everything back to the way it was before we camped, as the only thing a scout should leave is his thanks! We cook on open fires. 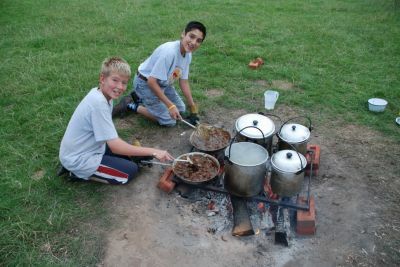 It is apparent that many scout groups have moved away from cooking on open fires and started cooking on gas or worse still have the scouters provide central catering. Our scouts cook on alter or trench fires as patrols in their own cook-house area. A scout patrol on our camp will work together as a patrol under its Patrol Leader (the scout put in control of the patrol) and Patrol Second to build and light the fire, keep it going, fetch wood (including the cutting of the wood with a saw or axe which is part of second class), prepare and cook food etc. Scouters (the adults involved in scouting) do of course oversee everything and there are procedures in place to ensure everything is safe, but it is important to us that the patrol works together as a patrol under the patrol leader. Working as a patrol teaches all kinds of skills that are useful in adult life too. Children have an intrinsic fascination of fire; it is important to us for our Scouts to satisfy this, but also to heed the dangers of fire. There is no better way to educate children about fire than to teach them to lay and light a fire without accelerant, and then to go on and cook proper edible meals off it that they can enjoy themselves. Many parents have commented on their child’s cooking ability after camp and have taken advantage of it! We camp in patrol tents. For our base camps (obviously not the cycle camp where lightweight tents are used), the scouts sleep in patrol tents; these are the 6- or 8-man ridge pole tents with heavy canvas. It is of the opinion of some scout groups that these are old-fashioned, however, these tents are very easily purchased today. The reason for this opinion is that these tents can easily last in excess of 20 years if looked after (which a scout does as he is thrifty). Our scouts erect and take down their own tents. These tents are brilliant for the patrol system; the tent must be put up by a patrol involving team work (for instance the poles must be held as the main guys are secured). An entire patrol can sleep in a patrol tent and it is again the Patrol Leader who is responsible for his (or her) patrol in his tent. We usually have a hike on the camp (usually as part of the 8-mile second class hike), which the scouts will usually plan and plan themselves using 6 figure grid references and work out the bearings, distance to next way point and travel time (using Naismith's law), etc. Afterwhich a log is usually written. We also visit a few places of interest and on the Friday, spend the day in a nearby town and have a Fish-and-Chip-lunch. The scouts will be given plenty of free time and oportunities to do some shopping etc. Although there is a degree of hard work at certain points, there is emphasis on fun and comradeship and the scouts have been known to be treated with buy ice creams etc.! In a recent camp, we visited Brownsea Island (where the experimental camp way held) and Corfe Castle. This is a weekend camp whereby the mothers or fathers (depending on the type of camp) get to camp as scouts under the command of a real PL!